This is from Norah’s diary–the diary of the English girl writing the same time as Joan is in the USA. This entry has some romantic intrigue! 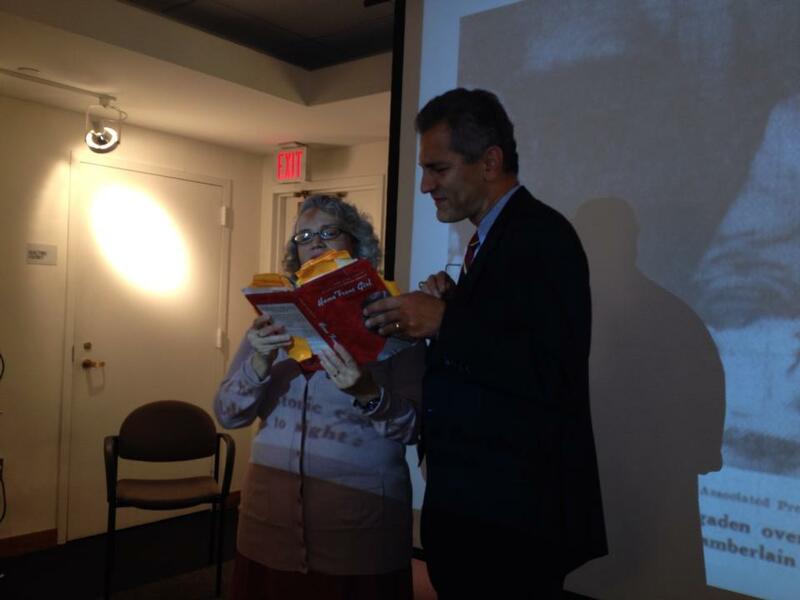 Last fall I gave a talk at my favorite library in the world: my hometown Morristown and Morris Township Public Library in Morristown, New Jersey. So many high school friends of mine came, and fans of my mom, Joan, author of Home Front Girl, arrived in droves–even in wheelchairs. It was really amazing. Those words still ring true. After the physical copies of Home Front Girl: A Diary of Love, Literature, and Growing Up in Wartime America, written by my mother Joan and edited by me, arrived in fall 2012, the kids eagerly each grabbed a book. Chatter and delight. “My name appears twice,” crows Sarah, who is not only mentioned in the Acknowledgements but also credited with the book jacket photo of my mom and me. While Jim had taken the photo, Sarah touched it up and focused it in that magical way only experts on Photoshop can (more on her expertise in other posts). Meanwhile, John gloats about how I describe him in the Acknowledgements. “She says I’m ‘tender-hearted! '” he triumphs in a distinctly untender-hearted manner. John, Sarah, and Susie reading Home Front Girl around the dining room table. Then we all settle in to read while Jim prepares dinner. All are intent on the book. Occasional banter bubbles up about some word or line of Grandma’s. At one point, Sarah says, “I say ‘purdy good’ just like Grandma does here.” She seems pleased to find this link between herself and her grandmother. Little does she know how many more there will be that she will discover! Beyond how everyone thinks she looks like Joan. At dinner Sarah tells about how, when she couldn’t fall asleep the night before, she created a television series in her head about a post-apocalyptic world. John pipes up suggestions and soon–they’re off to the races. Creating, describing, fashioning dialogue. A new generation of what my mother dubbed our family, all of whom write: The Morrison Writing Factory. Posted in Susie's Blog and tagged acknowledgements, Home Front Girl, Jim, John, Morrison Writing Factory, Photoshop, Sarah, Susie, tender-hearted. Bookmark the permalink. The National World War II Museum is an amazing place. So warm and welcoming. Veterans of the war greet you as you enter. And the exhibits, films, and artifacts are unique. 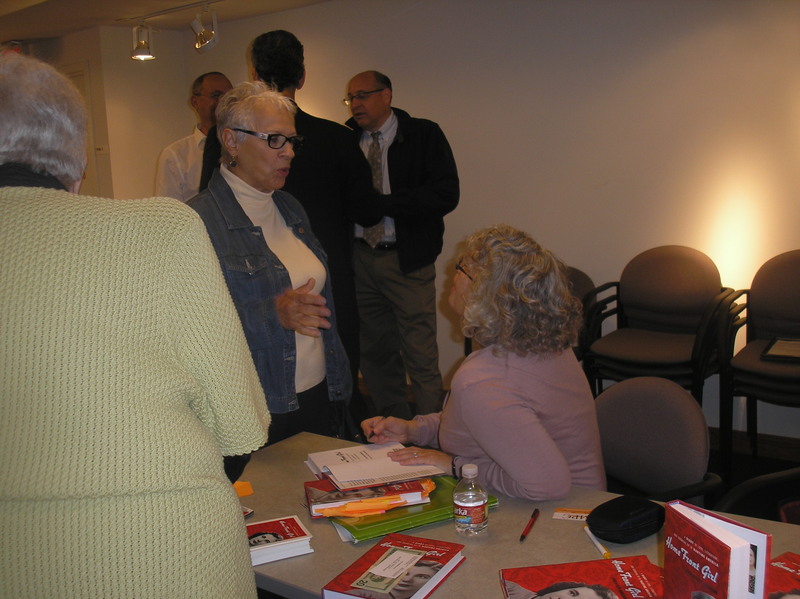 I had a wonderful time doing book signings of Home Front Girl there twice. Currently they have a fascination exhibit on propaganda posters of World War IIl. Look at the amazing ones they feature here. Posted in Susie's Blog and tagged National World War II Museum, propaganda poster. Bookmark the permalink. Nora is like Joan’s English twin. Nora’s great niece is writing about this wartime diary. This entry: wartime dances!